A local state of emergency has been declared at a northern Alberta First Nation after floods forced more than 100 people from their homes. 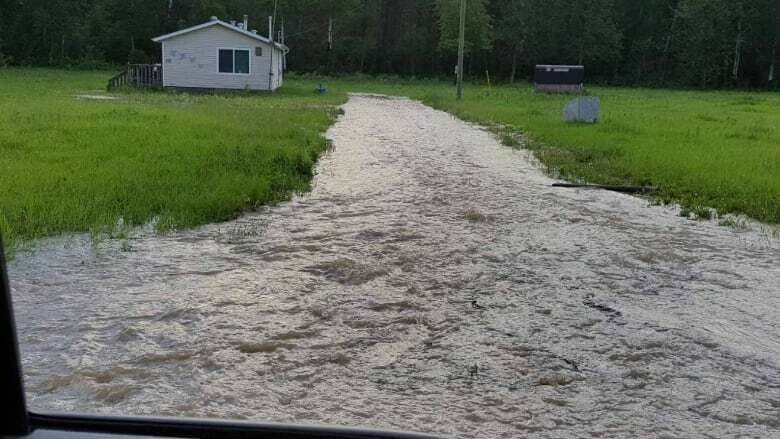 More than 100 people have been forced to leave their homes in Dene Tha' First Nation after several days of heavy rain led to flooding and a declaration that the community is in a state of emergency. Basements in several homes have been flooded. Power and water have also been knocked out at a number of homes in the community more than 800 km northwest of Edmonton. "The water came quickly," said Dene Tha' Chief Joe Pastion, who said several days of rain led to the nearby Sousa Creek bursting its banks. Pastion said the community of Chateh was the worst affected. Some roads have been blocked off because of standing water, he said. The band council has declared a local state of emergency and has set up a base command centre to coordinate an emergency response. Pastion said the numbers are changing quickly but it's estimated about 144 people had to leave their homes in the community of about 2,000. RCMP Const. Marty Reed said, in total, 37 households have been evacuated. A reception centre has been set up at the local school to help evacuees. "We're using the school and we have some cots available and we are providing some essential foods," said Pastion. He added an emergency exercise held in February had helped the First Nation prepare for this kind of disaster. The exercise was put on in partnership with Alberta's Emergency Management Agency. It was the first of its kind at an Alberta First Nation. The provincial government is offering support to the community. Pastion said there is a need for emergency supplies for those evacuees who are unable to go home. "Toiletries, personals and a lot of the household items that will be damaged due to the flooding. We have a lot of newborns and toddlers evacuated, so those essential needs have to be supplied," said Pastion. The Red Cross is standing by to offer help, but no official request has yet been made. Officials with the province say the creek that was overflowing reached its highest levels on Monday, but there's been drier weather since then. Pastion said standing water continues to cause problems in several areas. Damage throughout the community is still being assessed. Reed said there is concern about overhead power lines because of erosion from water. RCMP are patrolling the community to check on the homes people have been forced to leave. The province said 10 homes are currently still under threat from water. Workers are sandbagging the perimeter of the homes in an attempt to protect them.